Danfoss has made intelligent heating controls even smarter with the new TPOne-S programmable room thermostat. This latest addition to the TPOne family offers wireless internet connectivity so homeowners can control their heating remotely via smartphone from anywhere at any time. The TPOne Heating App allows users to adapt the thermostat’s pre-defined schedules and temperatures while on the move, saving money when away and improving comfort when returning home. Secure encrypted internet connection is assured via Danfoss cloud services. The new TPOne-S has all the intelligent and practical functionality of the existing TPOne models as well as the intuitive user interface and one-touch controls for exceptional ease of use and installation. Designed to suit almost any domestic heating application, TPOne-S enables easy programming, including true 7-day scheduling and holiday function. The large display and clear icons provide the flexibility to make temporary changes to pre-programmed schedules to save energy or increase comfort. The four dedicated comfort modes, Home, Away, Asleep and Standby, can be activated at the touch of a button to manually override existing settings if the user’s needs change at short notice. In addition to heating control, the TPOne-S also has a selectable domestic hot water channel. Independent tests have shown that lowering home comfort temperature by just one degree can reduce energy consumption by as much as 10%. With this in mind, Danfoss has designed TPOne with an innovative ‘Click and Save’ function which can lower pre-defined comfort settings by one degree in just a few clicks. This handy facility helps protect the environment and saves homeowners money at the touch of a button. For further energy savings, TPOne provides standard, delayed or optimised system start-up for improved economy and also has a selectable On/Off Load Compensation Control. When activated, the latter establishes a fixed cycle rate for the system and then determines the duration of On/Off periods within each cycle for optimum boiler efficiency and comfort. This advanced control means TPOne-S achieves ErP Product Class 5 and offers a compliant solution to the new Boiler Plus legislation. 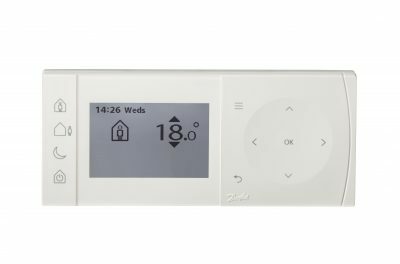 As well as providing smart and simple heating control for homeowners, TPOne’s quick start-up wizard and separate installer menu with lock ensure fast, accurate installation with familiar wiring.